Manufactured by Ferdinand Piatnik & Söhne, Vienna, 1916. Intended to attract donations on behalf of the Imperial Royal Austrian Military Widows’ and Orphans’ Fund, established in 1914, this elegant and refined deck was designed by Nellie Stern, a member of the Wiener Werkstatte (the Vienna Workshop, a community of visual artists which flourished 1903–1932, famous for it's Art Deco designs). The cards display beautiful subtle colours and intricate detail. The deck was printed by Ferdinand Piatnik & Söhne, Vienna in 1916 and reprinted in 1981 by A.S.S. 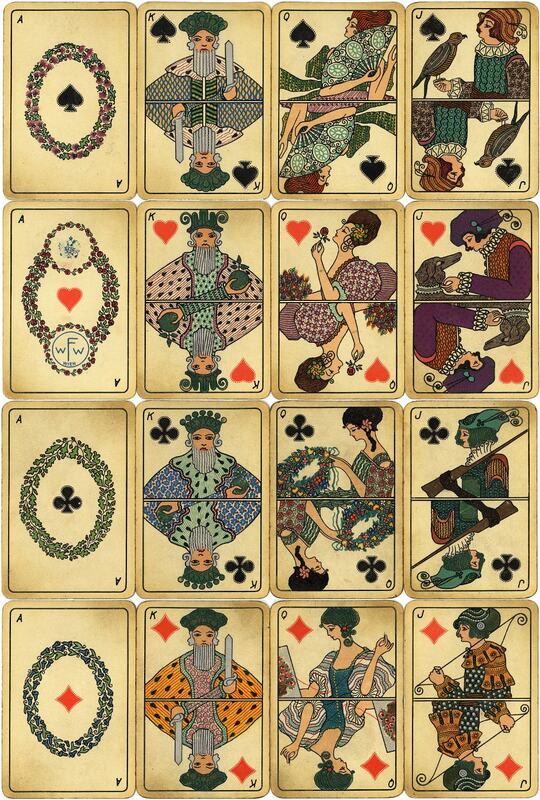 Above: Aces and Court cards from Wiener Waisenfond Whist No.1, manufactured by Ferdinand Piatnik & Söhne, Vienna, for the Imperial Royal Austrian Military Widows’ and Orphans’ Fund, 1916. 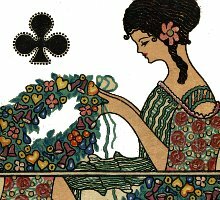 Designed by Nelly Stern. Colour lithography: 52 cards + Joker + 1 extra card: 91mm x 61mm. Images courtesy Barney Townshend.